Join us Wednesday, January 17, 5:30 p.m. @UnQuarked. This event is open to those of all ages! Note: The schedule for Science on Tap is changing. The new schedule will be the third MONDAY of each month with the exception of January and February of 2018 when there is a conflict with federal holidays. Quantum computing holds a promise to speed processing, reduce energy use, and advance many applications. This is because at the quantum level subatomic particles can exist in more than one state at any time. As people move from “bits” to “qubits” (quantum bits), a new future in computing is coming closer to reality with ever increasing qubit counts available on quantum computing systems. Join Stephan Eidenbenz, with the Lab’s National Security Education Center, and Patrick Coles, with the Theoretical Division, who will talk about the progress of quantum computing, why the Laboratory cares about this subject and, and some of the recent work we’ve done in this emerging field. 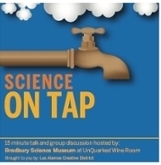 Science on Tap is a convivial opportunity to engage with Lab scientists on their current projects. A brief presentation is followed by lively questions, answers, and discussion. The fun normally takes place on the third Monday of each month from 5:30 to 7 p.m. at the UnQuarked Wine Room at 145 Central Park Plaza in Los Alamos. The sessions are a joint project between the Bradbury Science Museum and the Los Alamos Creative District.